There is the famous Lorenz effect that if a butterfly flaps its wings, its effect, though initially so trivial as to be barely unmeasurable, can cause a hurricane elsewhere several weeks later. Small causes with large later effects are particularly fearsome to us. Ionizing radiation causes mutations. That is why there is debate about use of x-rays in various contexts. And, thought they may not know it explicitly, it is why so many people fear radiation and nuclear power. 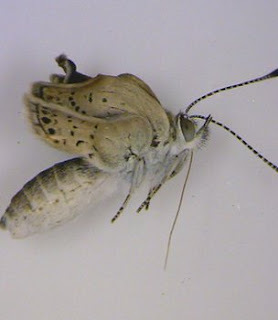 It is no surprise that there is a report that butterflies in the Fukushima reactor's neighborhood are now showing up with mutations, at rates notably higher than those due to the normal mutation rate. This poor victim in the photo will not make any ripples in the air---but could it cause a storm of reaction? The problem with nuclear reactors in terms of public perception is that there will be major disasters that will affect people in similarly grotesque ways. We know that no matter what protections we build in, some ill-alignment of small effects will occasionally cause a highly visible disaster. Nobody worries about the risk of CT scans when there really is an injury or disease to diagnose and treat. In that instance it is life, or quality of life, vs small or even barely measurable risk. But what about routine preventive or diagnostic screening such as by CT scans, regular mammograms, airport whole-body security checks, or even dental x-rays? This is difficult to answer. There the individual risk is very small, but can be estimated on a population basis. If the risk is small, but happens to you, then it's a major Lorenz effect! In the case of mammographic screening, the issues are not just about irrational fears, or even, surprisingly, about whether the x-rays cause more cancer than they detect. The issue is subtler: does routine radiation detect disease, that then is assumed to require therapeutic intervention which carries its own risk, but that would go away on its own? That's likely to occur much more often than radiogenic cancers, and it seems from several studies to be very measurable. Reactor fear is similarly numerically irrational in that most alternative energy sources available today involve much higher risk than nuclear plants, even if there were to be a Fukushima every now and then. Illness and death due directly or indirectly to coal or oil mining, transporting, or use (including air pollution and global warming and risk to agriculture by bad farming practices reliant on petro-based fertilizer etc.) are vastly greater. But they're dispersed and not palbably connected directly to your local reactor. There, the risk of radiation illness, especially to any one person, is trivial. These are statistical issues in a sense, but the probabilities involved are digests of many complex causal factors, so the probabilities themselves are hard to interpret. Also, the subjective way in which people react to probabilities are involved. And the issue is similar to the reasons why economists who assume 'rational man' have got things wrong so regularly: we are poorly educated about statistics, and we are emotional as well as rational beings. The two can't really be disconnected. The 'butterfly effect' here is in a sense the emotional reaction to rare but gruesome results from a local event, that spread with unpredictable consequences. Still, pity this poor butterfly, who committed no offense, but will never flit among the flowers.